​Grocery shopping is one of the most complicated parts of following a low FODMAP diet. Labels are hard enough to decipher, but when they start to call the same ingredient by a variety of different names it becomes near impossible… is it chicory root or is it inulin or vegetable fibre… confusing right? 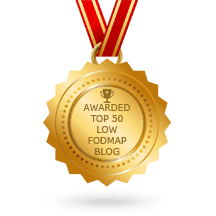 To make matters more complicated we have low FODMAP foods that become high FODMAP in larger serves. This means we are left to make an “educated’ guess as to if the product is low FODMAP and what the serve size might be ok… if we guess the wrong serving size it might send us running to the bathroom. ​FODMAPPED for you sauces are available in supermarkets and online in Australia, New Zealand, USA, Canada. Cobram Estate issued extra virgin olive oils are available in supermarkets and online in Australia and New Zealand. We all need a sweet treat occasionally, but that doesn’t mean you should end up in tracksuit pants feeling miserable. Kez’s kitchen agree that we all need that moment of bliss, and that food intolerances shouldn’t get in the way of flavours. Their certified FODMAP Friendly cookies are all of that, blissful, flavourful & low FODMAP. Everyone has their own favourite, master 9 loves the melting moments & my personal favourite is the Florentines. If you’ve been FODMAPing for a while, you most likely have come across these. These Vegan (yes even the chicken & beef flavours are vegan) stock cubes, state they are onion and garlic free and come in vegetable, chicken and beef varieties. They are only about 80 cents for a packet of 7 individually wrapped stock cubes. Just mix 250ml of water with 1 cube and voila low FODMAP stock. ​This classic creamy mayo has a low FODMAP ingredients list and is, well…seriously good! Enjoy on a salad or coleslaw, or mix it with lime zest, garlic infused olive oil, salt and pepper for a low FODMAP citrus aioli. Quick and easy snack when your on the go. This nut bars are low FODMAP certified by Monash. They are packed with heart healthy roasted nuts & seeds, faitrade coffee beans and a drizzle of chocolate on top. ​This has got to be one of the only seasoning mixes with neither onion nor garlic. It does have a spicy kick, so if you don’t like that use it sparingly. I use it as a spice rub for BBQ chicken, but it is just as good with fish or when creating burger patties. Missing ice-cream? This product range is perfect as it’s low FODMAP, vegan and dairy free. These coconut-based ice creams come in 9 smooth and delicious flavours. This is a great option for those who are vegan or dairy free as well as low FODMAP. It does actually taste like cream cheese and is delicious as a base for a dip or on a bagel with smoked salmon. Compared to its dairy based counterparts, Tofutti “cream cheese” is lower in fat and sodium and contains no cholesterol. 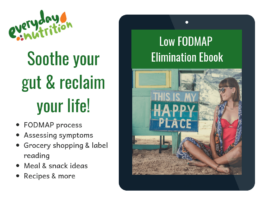 Soy can be a little confusing when it comes to FODMAPs. Its good to note that FODMAPs are types of carbohydrates. If the protein has been “isolated” (as seen in this product) it does not contain any FODMAPs. ​We love Japanese food and this sauce is a staple in our kitchens. It’s gluten free and contains no high FODMAP nasties like onion or garlic. I use it on chicken, fish or a stir fry to add some Japanese flair without the tummy ache afterwards.